If you are preparing to go into a consumer electronics retail store or major department store chain to purchase a new TV, be prepared to see a lot of the same familiar brands dominating the presentation shelves. 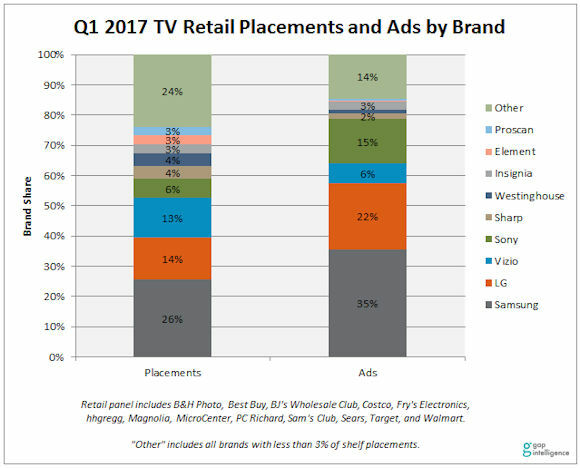 During the first quarter of 2017, the TV retail shelf space of the four major brands dominated the placement rankings: Samsung, LG, Vizio, and Sony captured a combined total of nearly 60 percent of all TV placements across the United States, said Deirdre Kennedy, television market researcher for gap. The 59 percent placement share compiled by the four brands represents an increase of three points over last year’s results for the same time period, Kennedy told HD Guru. Gap Intelligence defines a placement as the appearance of one model per retailer, so the same model placed at four retailers would be counted four times. Retail circular advertisements paint a more dramatic picture of the brand consolidation trend, gap found. The same top four brands (Samsung, LG, Vizio, and Sony) make up 78 percent of all TV ads placed in weekly circular print ads and their online counterparts. Most brands saw a year-over-year drop in the number of ad placements from 2016 levels, which showed an overall decrease of 21 percent from the first quarter of 2016. Kennedy said Samsung’s year-over-year advertising drop was the most dramatic, showing a reduction of 36 percent from the previous year. “The dip likely represents a shift in Samsung’s advertising strategy as the company may be opting to spend its marketing budget on different options and platforms. Despite across-the-board drops in advertising levels, the fact that the top four brands continue to advertise more heavily than the rest of the market indicates the importance of marketing to sales and placement retention among brick-and-mortar retailers,” Kennedy said. Meanwhile, Amazon’s TV placements have shown a market drop since July of last year, when the online retailer reached its peak of 297 TV SKUs offered on its site, Kennedy said. The current SKU count of 122 models represents a 51 percent decrease from April 2016, when the market was in the midst of its spring refresh as it is today. Among the top 10 represented brands on Amazon, Vizio and Seiki experienced the largest drops, falling 100% and 80%, respectively. Vizio SKUs have all but vanished from the site over the past year, as have models from TCL, Hisense, and Seiki, gap reported. Even Samsung, which regularly claims the highest shelf share at any retailer carrying its products, fell 58 percent from last April’s levels to its current placement count of 27 models. One explanation of these drops comes from gap’s methodology: the research firm doesn’t count placements of products sold through Amazon by third party vendors, and doesn’t count placements for products that are not currently in stock.